Given that so many of London's designers have been inspired by the plethora of megawatt art exhibitions around the capital, Osman Yousefzada's escape to the Orient offered a pleasant palette cleanser on the last day of the collections. Setting the scene, Yousefzada left a beautifully produced mood book on each guest’s seat sharing his far-flung influences and drawing together his exotic textures, colour and decoration, which were refined by minimalist silhouettes on the runway. Inspired by the ceremonial jewels of the Maharaja of Jaipur, seed beads were sewn in circular patterns, covering his strapless sheaths and cut-out shoulder tops with a subtle tactility, in addition to his soft, toe-less ankle and thigh-high leather boots. 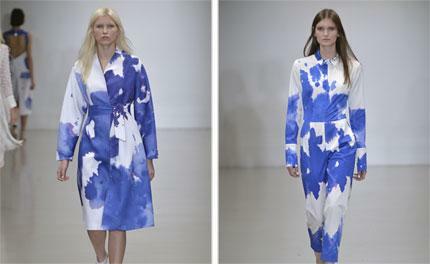 Exploding into colour, a Yves Klein blue inkblot print designed by Alex Beattie soon bled onto a summer-weight trench and backless jumpsuit. The show's escapist vibe also incorporated Yousefzada's playful reworking of traditional fez tassels, which were embroidered and printed onto his grass green midi skirt and fringed, collarless coat. A hippy undertone completed his shuffle of continental references - courtesy of an English 1960s festival set - which was imagined as a patchwork of jingling embellished tube skirts teamed with cold-shoulder and scooped-necked knits. Perhaps he did see Matisse's 'The Cut-Outs' after all.